A new mobile unit for Penn Vet's Shelter Medicine program is getting rolling this spring, bringing state-of-the-art veterinary care into animal shelters and underserved communities. Veterinarians Brittany Watson and Chelsea Reinhard led the program's efforts. 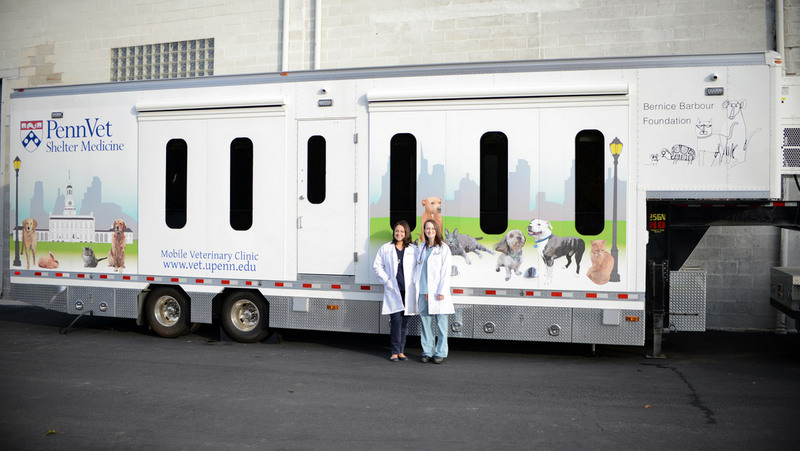 A cutting-edge mobile unit will allow the School of Veterinary Medicine to enhance its outreach to pets in shelters and underserved communities. According to the Humane Society of the United States, nationally an estimated 70 million dogs and cats lack a home. Of those, about 6.5 million wind up in shelters each year. Ensuring that more of these pets find a loving, caring home—and receive the proper veterinary care to stay there—is a daunting challenge, one that motivates the veterinarians and students who make up the Shelter Medicine Program in Penn's School of Veterinary Medicine. A new mobile clinic is making achieving their goals that much more attainable. At an upbeat launch event last week, Penn Vet unveiled a state-of-the-art, 40-foot mobile unit. 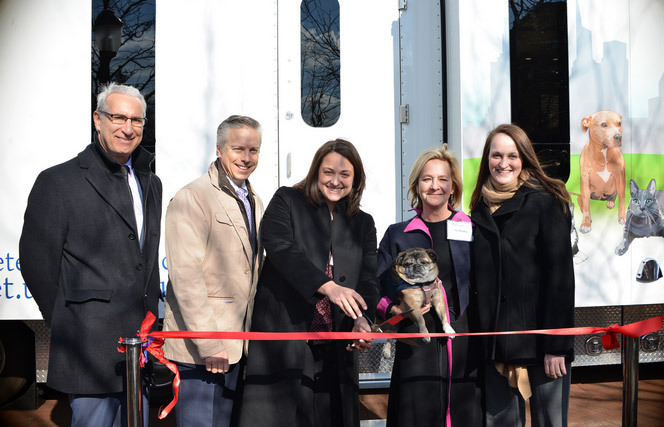 When it gets rolling this spring, the veterinary-clinic-on-wheels will help expand opportunities for treating pets in Philadelphia's underserved communities with preventive veterinary care. A celebratory ribbon-cutting ceremony marked the unveiling of the Shelter Medicine mobile clinic, a culmination of a vision that Watson (center) and colleagues dreamed up five years ago. Joining her in the festivities were, from left, Penn Vet Dean Andrew Hoffman, David Haworth of PetSmart Charities, Katy Champ of the Bernice Barbour Foundation (with Tupug the dog), and Reinhard. "We're looking forward to being a resource across the Philadelphia area," said Brittany Watson, director of the Shelter Medicine Program at Penn Vet. The path to this mobile clinic began nearly five years ago, when Watson joined the faculty at Penn. Her vision to expand the program included a roving clinic that would augment her team's ability to offer high-quality veterinary services and outreach to area shelters. While they already devote long hours to providing free services including spays and neuters and medical care at shelters and in community settings, the program's vets and students were often limited by the space available at the shelters and the equipment they could pack in their own vehicles. Watson's ideas garnered support from private donors and foundations, notably the Bernice Barbour Foundation and PetSmart Charities. 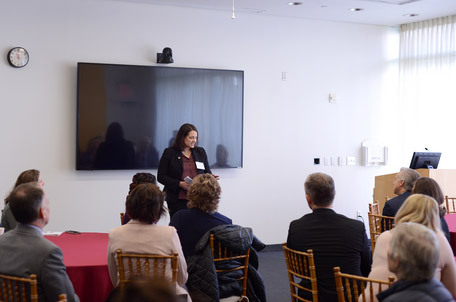 That funding also enabled the addition of Chelsea Reinhard, Bernice Barbour Assistant Professor of Clinical Shelter Medicine, to the staff, and an expansion of the School's shelter medicine and animal welfare curriculum. On a cold and bright morning last week, the program's supporters, along with students, staff, shelter representatives, community partners, and some special furry guests, gathered to celebrate and inspect the new unit. In her remarks at the launch event, Watson shared her hope to create a lasting impact with the mobile clinic, giving rise to "a new generation of veterinarians who have the skills to carry this work on." "It's an auspicious occasion," remarked Penn Vet Dean Andrew Hoffman at the ribbon-cutting. "This effort is really important to provide services that would be otherwise challenging to provide to our partner shelter organizations. "We all have a sense that having this mobile unit out in the community will be meaningful to the city of Philadelphia." clinic, giving rise to "a new generation of veterinarians who have the skills to carry this work on." The trailer was customized to Penn Vet's exact specifications. 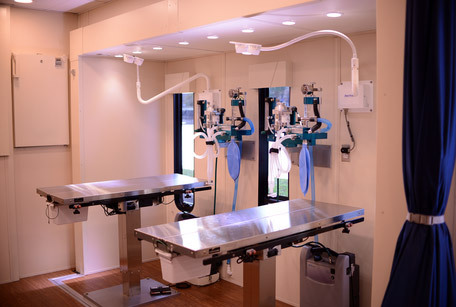 In addition to spaces for medical exams and surgical procedures, the trailer holds equipment to conduct radiography, ultrasounds, and blood tests. A diagnostic microscope has a large screen attached to facilitate teaching. The consultation and waiting area is equipped with a television monitor and an interactive whiteboard to allow for easier outreach and education. There are also plans to incorporate dental care technology. The educational component of the unit is key to Penn Vet and to Watson herself, who has a Ph.D. in education. "We're making an impact in the moment, which is very important," she said, "but we're also trying to create systemic change with our partners and create a new generation of veterinarians who have the skills to then carry this work on and maximize our impact." The mobile unit, equipped with space and technology for spays, neuters, diagnostics, and other medical care, will help enhance partner shelters' ability to treat their animals, increasing the chance they'll be placed in a loving home. Beyond serving the primary goals of improving care and welfare for shelter animals and enhancing education opportunities for vet students and the public, the flexible nature of the clinic will allow the shelter medicine team to respond to needs as they arise, including disaster response. "We've seen around the U.S. more times than we like that veterinarians have been required in emergency situations," said Hoffman. enhance partner shelters' ability to treat their animals, increasing the chance they'll be placed in a loving home. At the ribbon-cutting, four dogs that have benefited from the Shelter Medicine Program were among the honored guests. Dylan, Tupug, Stout, and Stella were all beneficiaries of the Richard Lichter Charity for Dogs, which provides funding to treat shelter animals in need of specialized veterinary care. All four dogs have been adopted by members of the Penn community. Stout's image, along with those of other donors' pets, is featured on the mobile clinic's cheerful exterior. 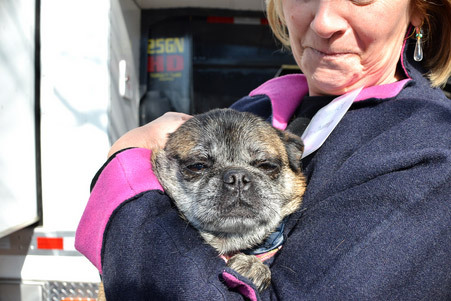 Special guests at the event included canine beneficiaries of the Shelter Medicine program, like this pug, Tupug. The Shelter Medicine Program has several shelter and community partners, which include Animal Care and Control Team (ACCT) Philly, Morris Animal Refuge, Pennsylvania Society for the Prevention of Cruelty to Animals (PSPCA), the Philadelphia Animal Welfare Society (PAWS), Providence Animal Center, Women's Animal Center, Delaware Humane Association, The Spayed Club, and Pets for Life. This spring, the mobile clinic will pay visits each week to partner shelters, offering diagnostic and surgical assistance. The unit will also work with community partners to provide care in underserved communities, and with Philadelphia schoolchildren to share information about animal health and welfare. "We're really looking forward to getting out on the road," Watson said. © 2018 Bernice Barbour Foundation, Inc. All Rights Reserved.